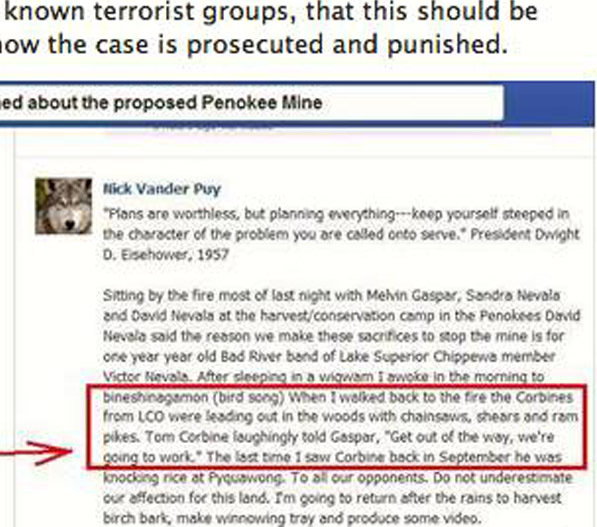 Iron County Forester Gary Glonek has been openly posting racist and misleading materials on his Facebook page that are attracting the attention of the Lac Courte Oreilles Band of Lake Superior Chippewa tribal attorneys. An avid and outspoken extreme pro-mining activist, Glonek is also part of the department that oversees public county forest lands, including the area where LCO has established a Harvest Camp. According to Paul DeMain (Oneida/Ojibwe), the spokesperson for the Lac Courte Oreilles Harvest Camp, the LCO Tribal Government has not received a phone call, letter or any other correspondence regarding the tribal resolution establishing the camp, adopted unanimously by the Iron Country Forest and Park Committee on May 14 without opposition and included a provision to extend a permit for a one-year period starting May 1, 2013, until April 30, 2014. The basis for the resolution proposed that the treaty harvest camp be exempted from the usual 14 day camping ordinance of the county, and allow up to 125 people to utilize harvest permits as a group that are typically waived on an individual basis. Counties can not charge Ojibwe citizens for permits to pick or utilize resources reserved or covered by provisions of federal treaties which secured title for public and private lands in northern Wisconsin over a century ago. Glonek works under Iron County Forest Administrator Joe Vairus, the same person who was responsible for crafting part of a questionable lease in 2011 involving payments for 3,331 acres of county forest land where GTac plans to dump their overburden. West Virginia-based GTac lawyer Jennifer Leahy and Iron County’s corporate counsel drew up most of the provisions, which appear to have been done without a public hearing or adequate notice to Iron County residents. Both Glonek and Vairus are public servants of Iron County. 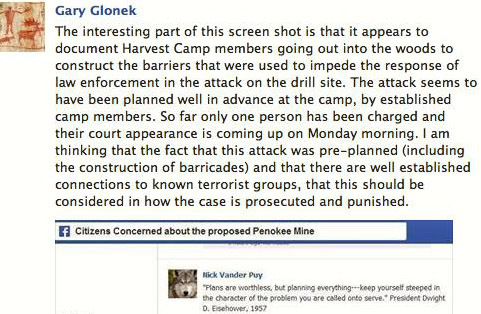 Glonek went on to post statements that criticized local Iron County officials for allowing a “Permit Free Base of Operations.” The local county Sheriff, Tony Furyk, who also attended the May 14th meeting, has described the camp as “permitted” camp. 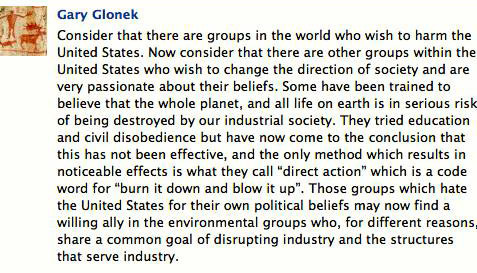 According to Glonek, the term “direct action” means “burn it down and blow it up,” as opposed to people coming together in self-defense against unjust laws such as the new mining law. GTac has openly deceived the public from the beginning of their entry into the state. During a WPR broadcast on January 19, 2011, Matt Fifield, Project Director for GTAC, explained, “If the question is, ‘are we trying to influence them to pass legislation that’s going to weaken environmental laws, that’s going to weaken federal and state air and water quality,’ the answer is ‘no.’” What Fifield didn’t reveal was that G-Tac was actually in the process of authoring a new mining bill, and while it did not weaken the standards, it simply did not require the mining company to have to comply with them. After lying to the public for months claiming they did not know who wrote the bill, Sen. Scott Fitzgerald (R-Juneau) admitted the truth after AB426 did not pass the Senate in March 2012. Written by GTac lawyers, the revived bill AB1/SB1 passed in March 2013 in large part because Republicans were influenced by GTac. Legislators working for GTac disregarded the overwhelming public sentiment against the mine, including scientific evidence of potentially overwhelming environmental destruction and elected officials from the Lake Superior Basin explaining the irreparable damage a mine would do to the area’s watershed, air, health and the local economy. For some mining opponents, these actions could be considered treason on the part of legislators who swore an oath to protect the constitution and the State of Wisconsin. Citizens are now being forced to defend their very lives against an out-of-control power-hungry legislature and a governor who is doing the bidding of billionaire coal mining baron Chris Cline. Glonek continues to slander the LCO tribe. The purpose of the Harvest Camp is to provide education on the hunting, fishing and harvesting rights that the tribes have in the ceded territories. Some individuals involved in the June 11 incident may have been staying at or near the camp, and without informing their hosts, acted on their own. Other participants came from the local region near Upson and were staying in nearby camp grounds. Those overseeing the camp were instructed by tribal officials to maintain an honest and open relationship with local law enforcement officials because of the treaty status of the camp. Afterward, the camp made it clear that this kind of behavior would not be tolerated. There have been no other incidents. 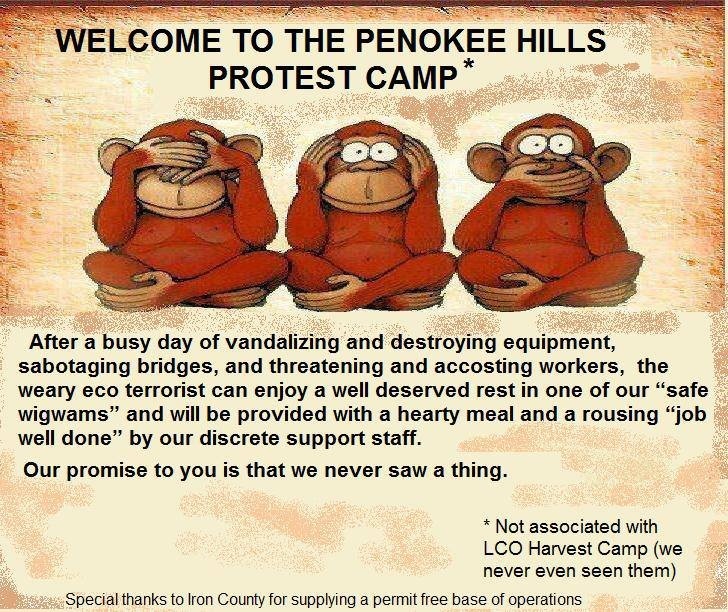 Glonek, however, continues to make false statements about the camp, referring to them as “eco-terrorists” and posting racist cartoons. LCO leaders received unanimous support from the Iron County Forest and Park Committee when applying for a permit to establish the camp. To this date, however, a letter of agrement anticipated by the tribe has not been returned. Forestry Office Manager Tara Stuhr claimed that a letter was sent to LCO on May 29 requesting more information. However, camp spokesman Paul DeMain states that that tribal attorneys have not located any such communication and that during a call to the forestry department in earlier June, Stuhr told DeMain that the documents were still on Vairus’s desk. Iron County won’t be able to afford employees if they let GTac leave them with liability for a 3300 acre superfund site.